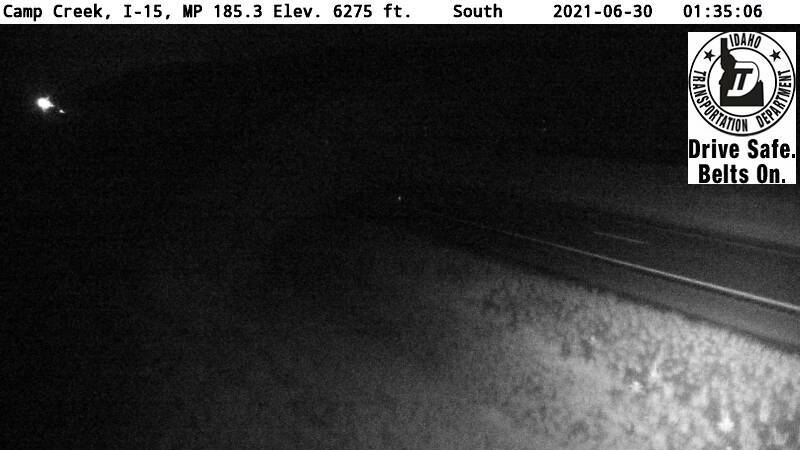 Webcam Spencer, Idaho: Camp Creek - I-15, M.P. 185.3 - A view of the current traffic situation. Spencer, Idaho: China Point - I-15, M.P. 178.5, 7.1 mi. Lone Pine, Idaho: SH-28, M.P. 49.2, 40 mi. Sage Junction, Idaho: I-15, M.P. 143, 41.1 mi. Henrys Lake, Idaho: US-20, M.P. 401, 44.8 mi. Thornton, Idaho: US-20, M.P. 328.1, 49.5 mi. Gilmore, Idaho: Gilmore Summit - SH-28, M.P. 73.5, 51.2 mi. Osgood, Idaho: I-15, M.P. 129.9, 53.5 mi. Payne, Idaho: I-15, M.P. 123.7, 59.4 mi. This webcam Spencer, Idaho with the theme Traffic was added on March 15, 2012 and is operated by Idaho Transportation Department. It got 384 visitors since then. Shouldn't this webcam work or should the link be wrong please report that here. You can add this webcam here to myCams.